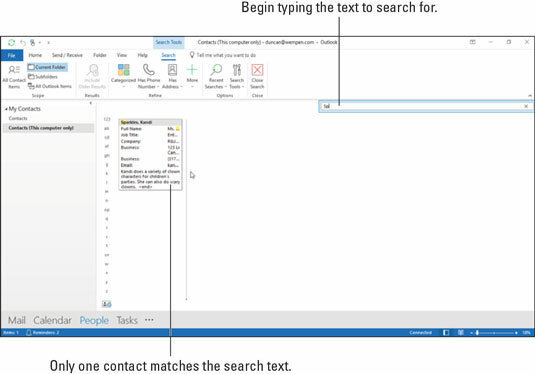 The whole reason for entering people’s contact information in Microsoft Outlook 2019 is so you can find them again. Otherwise, what’s the point of all this rigmarole? Finding names in the People module is child’s play. You can browse or search from any view of the People module. To browse, just page through the contacts using the vertical scroll bar. To search, enter a name or any other relevant text in the Search Contacts box and select what you want from the search results. Here’s how to do it from Card view—which you haven’t worked with yet officially. It’s like Business Cards view, except the cards are of different sizes based on the information they contain, and they’re arranged in columns. In the People module, choose the Card view in the Current View group on the Home tab on the Ribbon. The Card view appears. Click in the white space below any card and begin typing the first few letters of the desired contact’s last name. The display jumps to the first instance of that name and highlights the card heading. For example, in this figure, the author just typed Sp because he’s looking for Kandi Sparkles, a delightful clown he saw at a children’s party last week. Start typing the first few letters of a name to jump to a card that matches it. Card view has lettered tabs along the left edge. You can browse your contacts by scrolling, but if there are a lot of them, you might find it quicker to click one of those lettered tabs to jump quickly to last names that begin with the chosen letter. Of course, you may need to base a search for a contact name on something like the company the contact works for. Or you may want to find all the people in your list who live in a certain state — or people who put you in a certain state of mind (now there’s a useful tidbit to include in their contact records). In such a case, the Search tool takes you to your contact. 1. 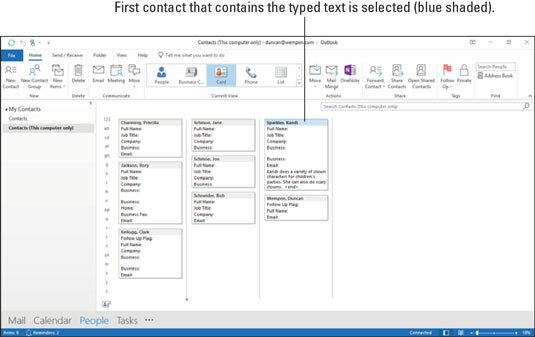 In the People module, with your favorite view chosen, type the text you want to find in the Search Contacts box and then press Enter. The Search box is found at the top of your Contacts list, right below the Ribbon. Your Contacts list shrinks to those that contain the information you typed, as shown. If you get no contacts that match your search, check to see whether you correctly spelled the search text you entered. 2. To remove the search filter, click the X button at the far right end of the Search box. Use the Search box to narrow down the displayed contacts to those that match your criteria. It’s hard to be as stupidly literal as computers; close doesn’t count with them. If you see Grg Wshngtn, you know to look for George Washington, but a computer doesn’t. George would have to have his vowels removed before a computer would see those two names the same way. On the other hand, if you have only a scrap of the name you’re looking for, Outlook can find that scrap wherever it is. A search for Geo would turn up George Washington as well as any other Georges in your Contacts list, including Boy George and George of the Jungle (provided they’re all such close personal friends of yours that they’re in your Contacts list).